Airway Muscle: the thin layer of muscle within the wall of an airway can contract to make it tighter and narrower. In people with asthma, this muscle is often “twitchy” and contracts more easily and more strongly than in people who do not have asthma. Reliever inhalers relieve symptoms by relaxing these muscles in the airways for a few hours. 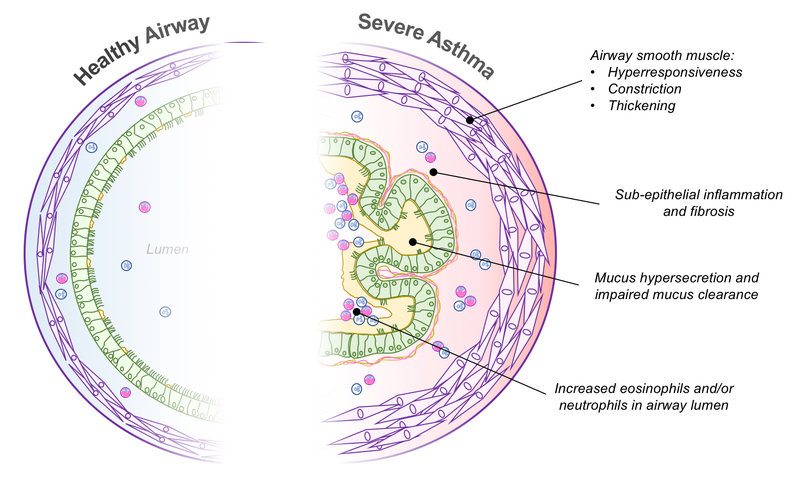 They do not treat other aspects of asthma described below. Inflammation / Swelling: the inside walls of the airways are often swollen and inflamed, leaving less space inside. Preventer or controller medicines work by reducing the inflammation that causes the swelling. Mucus: mucus production is normally a protective response, but in severe asthma, it is excessive and can block the inside of the airways – preventer medicines also reduce mucus. Fibrosis or Scarring: ongoing inflammation in the airways can lead to development of scar tissue and “tissue remodelling”. This results in thickened airway walls and increased smooth muscle.